Heat tortilla in a skillet. Remove from pan and wrap in foil to keep warm. Add butter to the pan, and sauté garlic until lightly browned. Add tomatoes and cilantro and sauté for a few minutes. Set aside. Pit and dice avocado, sprinkling lime juice on top to prevent discoloration. In a separate skillet, fry bacon slices until browned. Remove from pan and chop. In same pan, crack two eggs and cook until whites are set and the yolks are still soft. Remove and place on top of tortilla. 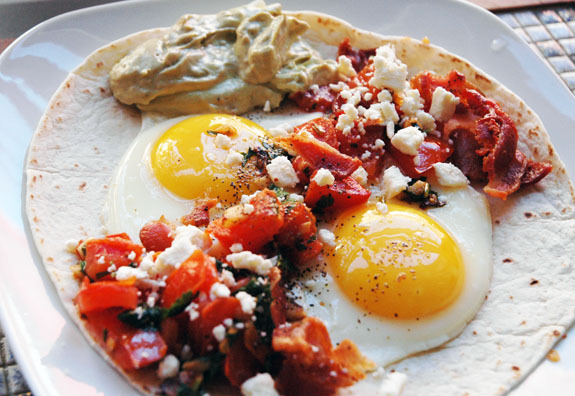 Arrange avocado and tomato-cilantro mixture around the eggs. Sprinkle with bacon and feta, and season with salt and pepper. A few notes on preparation: As we had some leftover avocado dip from a previous recipe, we used that instead of avocado. The original recipe actually called for 3 oz sliced chorizo sausage rather than bacon, but we went with what we had on hand. In the end, it was a successful and fairly healthy breakfast. David noted that this dish would even do well over a bed of rice, to give something to soak up the runny egg more than the tortilla. Also, garnishing with a bit of fresh cilantro would be good as well. David commented that it was a fresh-tasting and hearty breakfast. If David weren’t flu-ridden, I would’ve probably added some sliced jalapenos to the tomato mixture to spice things up a bit. He surmised that an “Italian” version would also be tasty, substituting sour dough bread for the tortilla and basil for the cilantro.